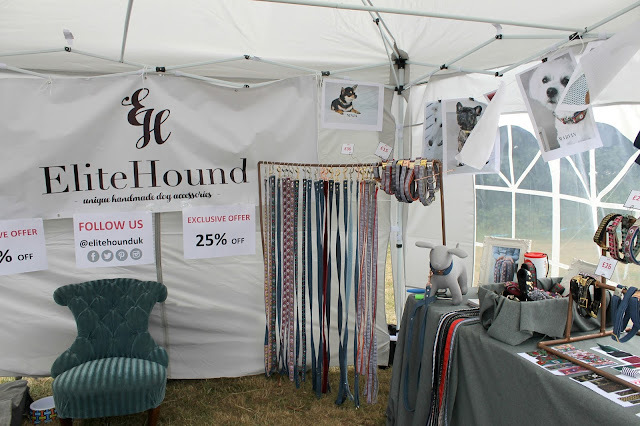 We had an absolutely fabulous time at Dog Fest on Saturday, and I couldn't wait to share some photos with you! 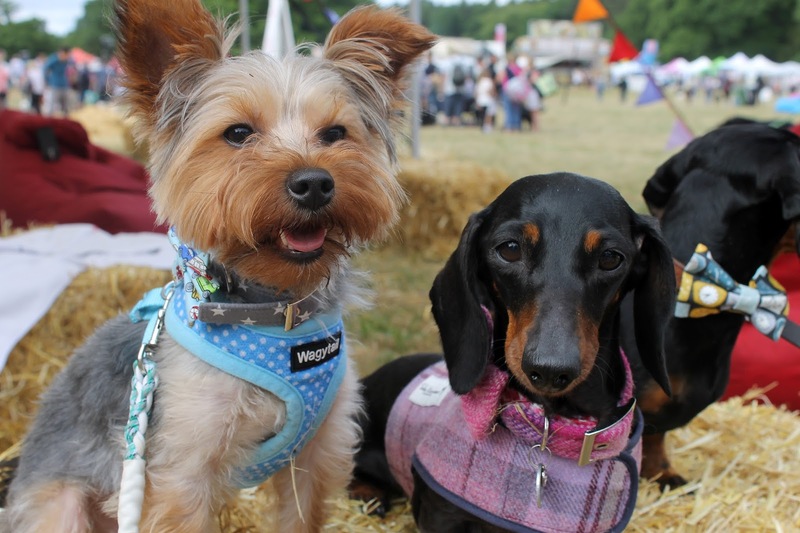 Dog Fest South was held at Knebworth House in Hertfordshire this year, which is just over an hour away from us. I'm a nervous driver but it was super easy to find, and we managed to beat the queues by heading there early! I just wanted to take a minute to say that the event was really well-organised: there was plenty of space, chill out zones, shady spots with water troughs and lots of parking. Last year the venue felt a bit cramped at times, but in the grounds of Knebworth House there was lots of room to wander. We went to the event with our friends Bernie, Sev and their lovely owners... we couldn't believe how many other dachshunds we saw throughout the day! Sev's Mum, Jaime, took this fab photo of Sev and Winnie on the signature Guru chair! 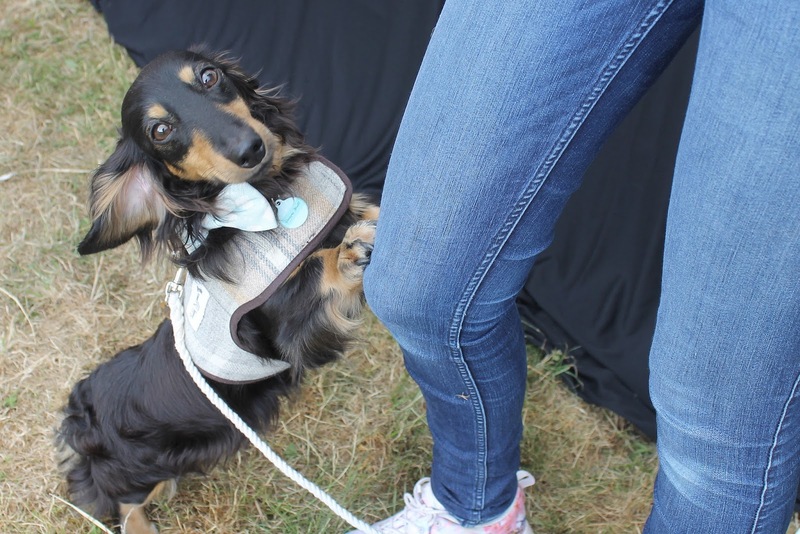 ^ I didn't get a chance to talk to the Guru team, as their stall was super busy and I was of course juggling both my dogs (who actually behaved really well, despite my last blog post!) We had to snap a few photos of them in the chair though, as it's a staple of every show! Hopefully we'll get a chance to see them again at another event, where we can have a proper chat! We couldn't resist even the daftest of items; one stall was selling hilarious dog clothing, including shirts, dresses, pyjamas and all sorts! I very nearly bought Archie some froggy pyjamas, but reined myself in at the last minute... I think Archie would disown me forever if I put him in something like that, bless him. Sev was treated to a Hawaiian shirt, which came in very handy at a different stall later on, and Bernie tried on some adorable dungarees. Testing out the furniture at the Elite Hound stall! One of my favourite parts about events like this, is that I can discover new brands I haven't previously come across. One such small business is Elite Hound! They were selling beautiful collars, leads and other accessories... and gorgeous greyhound Mick was helping out on the stall too! I really loved the denim collars and leads in particular, they were so timeless. We've followed them on social media, and will definitely keep an eye out for them at future shows! We were so excited to meet the Benyfit Natural team! I've been wanting to transition the dogs onto raw food for such a long time, but it's a big decision to make. After seeing the food in person and chatting to the lovely girls on the stall, I'm feeling more confident to make the switch. For now, we took some details and picked up some yummy venison bites! I think Archie stole a few hearts at the stall, and it was so nice to see him getting some cuddles! Everyone fawns all over Winnie, but it's rare that Archie gets much attention. 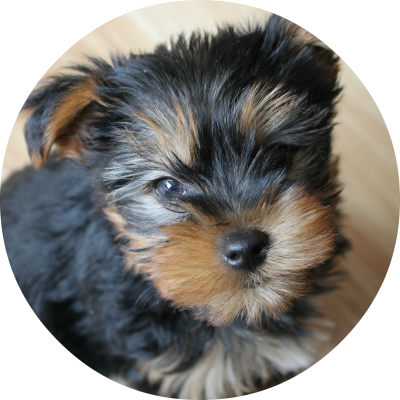 He's such a precious little dog, and so loving, so it made a nice change for him to get some fuss! Thank you Benyfit! Of course, we had to pop by the PitPat stand and pick up our first activity tracker! I've wanted one of these for Archie for so long, so I took the opportunity to grab one at the show. The boys all posed on the #PitPatPetaway deckchairs (I love the photo I took of Sev and Bernie!) and Winnie got lots of cuddles too. I've set up Archie's PitPat today and I'm loving it so far; it monitors their activity, and you're given a daily exercise goal for them to hit. It'll be so fun to compare Archie's stats with those from my fitbit! I'm sure we'll write a blog post on it soon. We've been following Huxley's IVDD story on Facebook and Instagram, so we stopped by the Huxley Hound stall to say hello and pick up some treats! The HH team are so lovely and friendly, and their products are top notch. The dogs love the dried organic treats, and this time they kindly gave us some of the parsnip variety to try. We were so happy to hear that Huxley is doing well and resting up, I hope he's back to his usual self very soon! Of course, we also had to swing by and see our friends at Broughton and Co. I treated both dogs to a new collar, as there was a special show offer that I just couldn't resist! The best part was that they had their engraving machine at the stand; you could purchase a collar or other accessory, have it engraved, and collect it later on! I had Winnie and Archie's names engraved onto their collars, and they look gorgeous. I absolutely love everything that B & Co sells, and I'll be heading back to their stall at Paws in the Park this weekend. 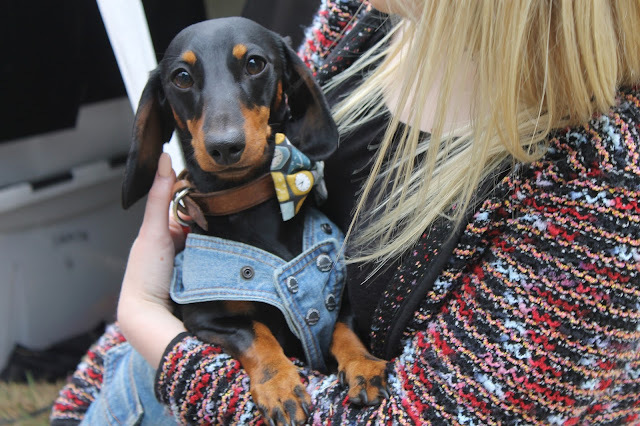 Thank you to Sarah from Twilight Bark UK for the photo! There was so much going on at Dog Fest this year: water diving, hay bale racing, agility, a fun dog show, the big dog walk and all sorts! Of course, there was also the main stage where Supervet Dr. Noel Fitzpatrick did a talk, and there was live music most of the day also. If I were by myself I think I'd have taken part in a few activities, but for me the highlight of Dog Fest was getting to hang out with some of my blogging/twitter friends! As I said, I attended the event with my friends Jaime and Shannen, but we also got to catch up with Silly Tilly Poodle, Adventures of Doodles, The Cotswold Collies, Fraggle and her Mum (who very kindly gave me their free ticket!) and the lovely Sarah from Twilight Bark UK. Sarah actually took the fab photo above, of all six of our dogs! It was SO nice to meet everyone and their dogs "in the flesh", we saw so many insta/twitter famous pooches too! Our next post will be all about the goodies we bought at the event, can't wait to share them with you! Did you go to Dog Fest? Let us know in the comments! Help! My Dog is Reactive!